David Alderman is a barrister at William Forster Chambers in Darwin, Northern Territory. 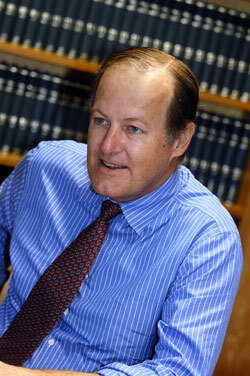 David was first admitted to practice as a solicitor in South Australia in 1979. He moved to the Territory in January 1980 to work for the Darwin firm Ward Keller where he became a partner in 1986. David joined the Independent Bar on 1 February 1995. David’s main area of practice is commercial litigation but he has a healthy balance of common law work as well. His work in the commercial area has included problems relating to contracts, construction law, partnerships, banking, the Trade Practices Act, insolvencies and administrations, workmen’s liens and Corporations. His common law practice includes personal injuries, insurance law, professional negligence, motor accidents and crimes compensation. He has also dealt with problems relating to discrimination, work relations and coronials. In 2003 David started doing mediations as mediator and looks forward to increasing his involvement in this area of work.